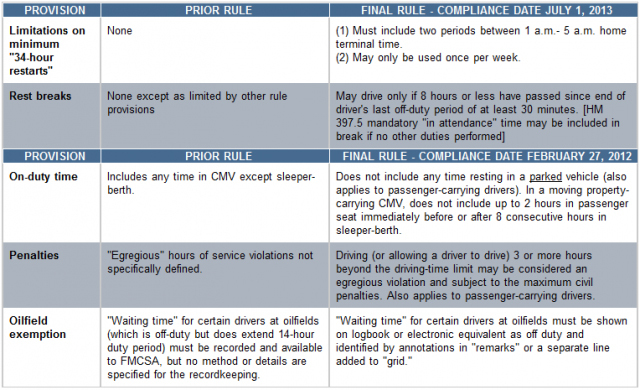 You've probably heard about FMCSA's Hours of Service revisions lately. These new truck driver regulations have caused a bit of an uproar among the trucking community, which believes that they might possibly make matters worse as opposed to improving the industry situation. The table below, courtesy of FMCSA, details the existing HOS rules and the updated rules that will go into effect July 1, 2013. Prior to the new HOS regulations, there were no limitations on how many 34-hour resets you could take within one week's time. As of July 2013, drivers will only be allowed to take one reset a week. The 34-hour reset must include two periods between 1 am and 5 am (two nights off). Drivers must take a 30 minute rest break every 8 hours. The 30-minute break can be taken at any time; it does not need to be taken at the very end of an 8-hour driving stint. 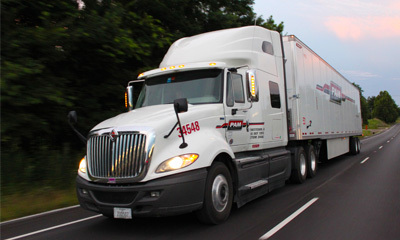 The new HOS regulations reduce the maximum amount of hours a trucker can work in a week by 12 hours. Long haul truckers will now only be able to drive a maximum of 70 hours a week, down from 82. This could lead to a 17% reduction in work time per week as many drivers deliver and drive overnight to avoid congested interstates. The updated hours of service could cause delays and actually could end up being more detrimental to highway safety as there would be more trucks on the road during peak travel times in order to compensate for the loss in weekly hours driven. The ATA requested that the FMCSA delay implementation of the new HOS rules and debated that the new ruling will cost the trucking industry $320 million in training drivers on the new rule, reprogramming software and other transitional costs. The FMCSA denied ATA's request to delay the new Hours of Service. As it stands, they will go into effect July 1, 2013 (other changes to the rules have already gone into effect as of February 27). What do you think of the new HOS rules? Please share your thoughts in the comments section below! Apply Now Fill out the Driver Solutions no obligation online application for more information on entry level truck driving jobs! Filling out an application does not commit you to anything, but allows you to schedule a time to speak with a Driver Agent about your career options.